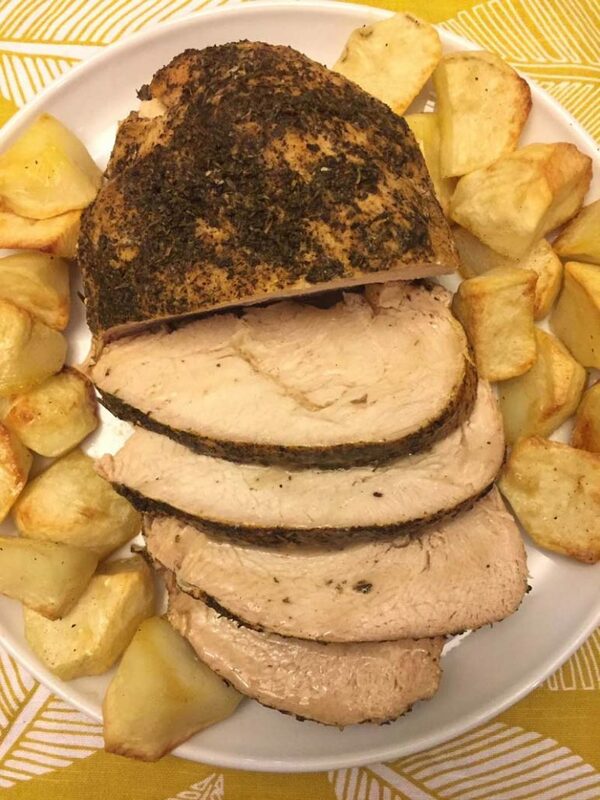 This Instant Pot turkey breast is the juiciest moistest roast turkey breast ever! Just throw it in the Instant Pot and dinner is ready! 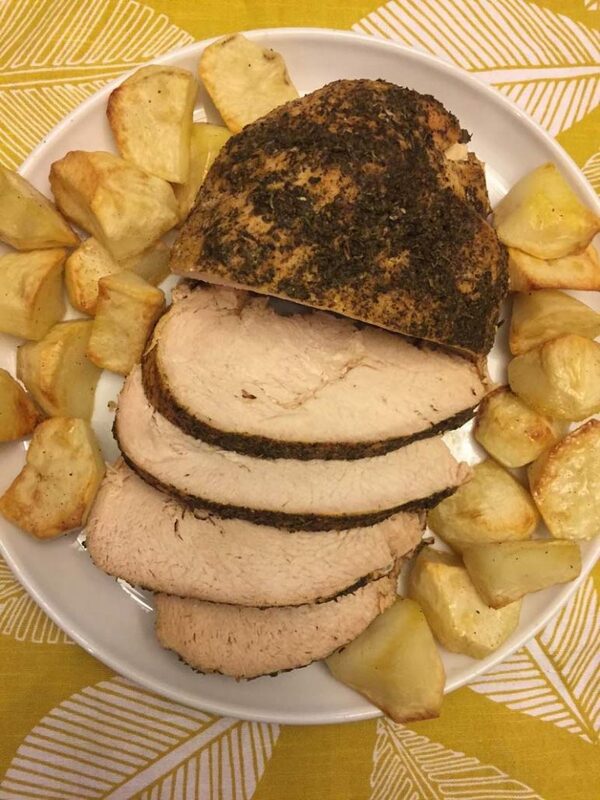 This Instant Pot turkey breast is simply perfect! Rubbed with spices on the outside, tender and juicy on the inside, every slice is just made to melt in your mouth! 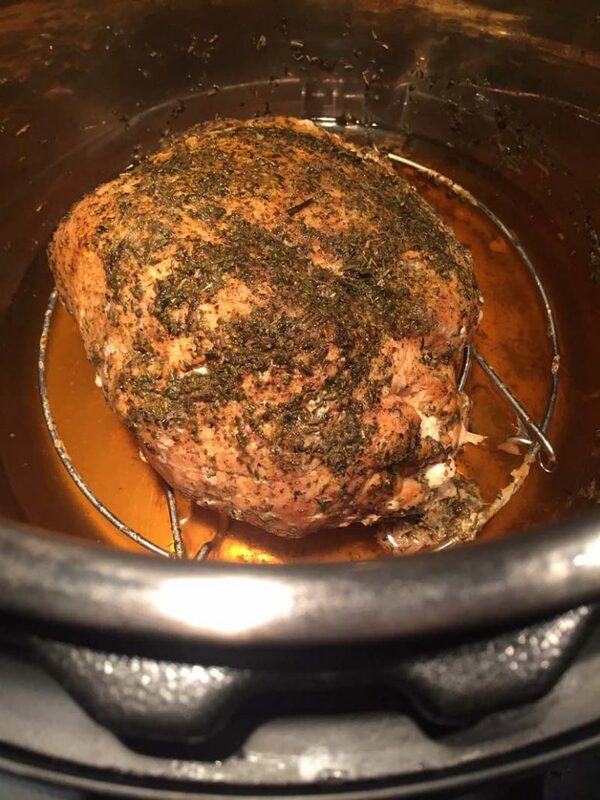 Before I got my Instant Pot, I used to cook turkey breast in the slow cooker. However, Instant Pot achieves the same results much quicker! It takes the slow cooker 3.5 hours on High or 7 hours on Low to cook this turkey breast, while it takes only 25 minutes in the Instant pot! 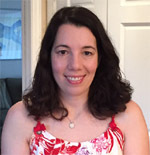 If you don’t own the Instant Pot, read my article “What Is Instant Pot” to learn more. So as you can see, I’m not a fan of cooking turkey breast in the oven, I think it turns out way juicier in the Instant Pot or crockpot. However, my go-to recipe for WHOLE Thanksgiving turkey uses the oven, but my method is also quite unusual – I use brown paper shopping bag to cook my Thanksgiving turkey 🙂 If you try it once, you’ll never make Thanksgiving turkey any other way, it’s truly a no-fail method to produce the juiciest beautifully browned turkey with no basting. Curious? Check out my Thanksgiving turkey in a brown paper bag – I make it every single year! Anyway, back to the turkey breast 🙂 My favorite thing about cooking turkey breast in the Instant Pot is that you can cook it from frozen! So if you have one of those frozen packaged turkey breasts stashed in your freezer, you’ve got dinner! 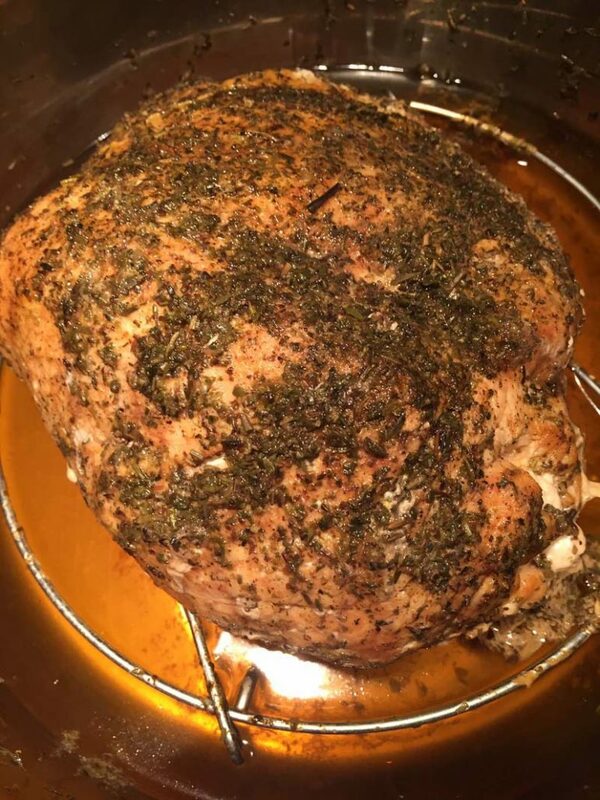 Just throw in the solid frozen turkey breast in the Instant Pot and it will cook it perfectly and evenly and the turkey breast will be moist and juicy! The only difference between cooking fresh or frozen turkey breast in the Instant Pot is the cooking time! Instant Pot pressure cooking time for fresh turkey breast is 25 minutes on High pressure, followed by 10 minute natural release (NR). Instant Pot pressure cooking time for frozen turkey breast is 1 hour, also followed by 10 minute natural release (NR). For the exact instructions and ingredient quantities, see the printable recipe on the bottom of the article. Like the side dishes on my plate with the turkey slices? They are also made in the Instant Pot! Want the recipes? 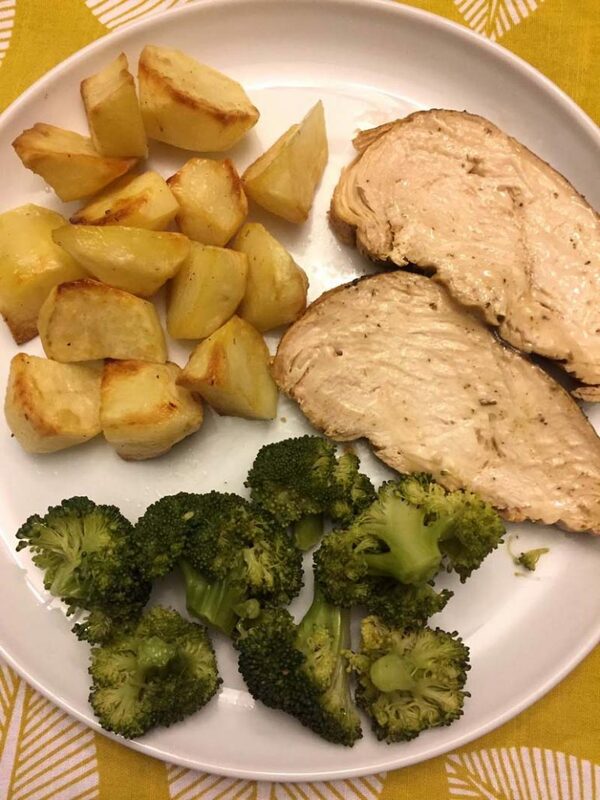 Check out Instant Pot broccoli and Instant Pot roasted potatoes – yes, now you are going to want the second Instant Pot 🙂 Want gravy? 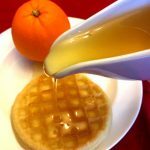 You can make it in the Instant Pot with turkey drippings! 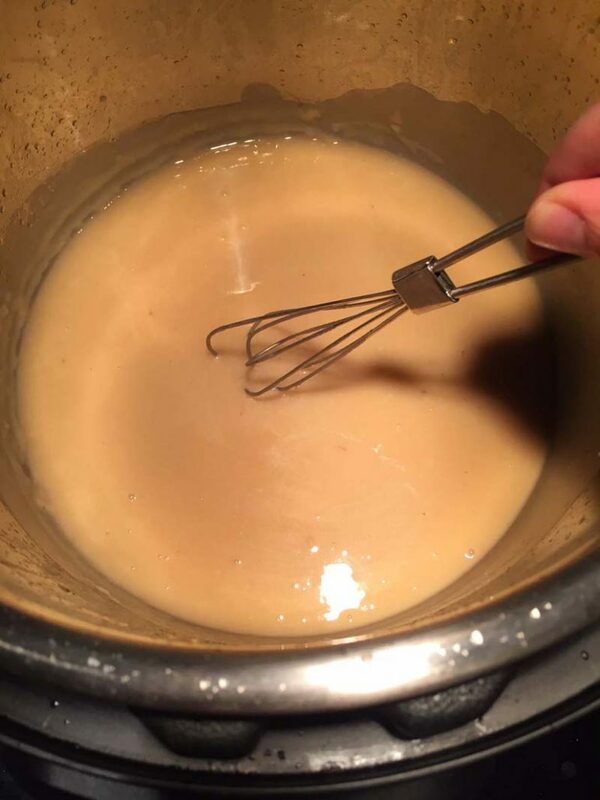 Here you go: Instant Pot gravy recipe. Turkey breast is lean and healthy, it’s a clean eating staple. Pair it with Instant Pot brussel sprouts and sweet potatoes for a healthy dinner! You can also use leftovers for sandwiches, or cut it up as use as a salad protein, or even make leftover turkey salad. 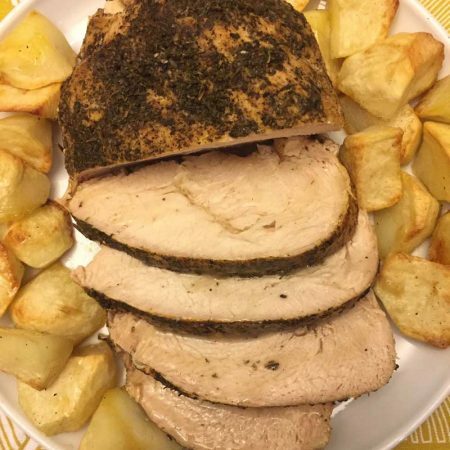 Cooking turkey breast in the Instant Pot saves you so much money over buying natural roasted turkey breast at the store! I’m not talking about processed cold cuts, I’m talking about real turkey breast. Whole Foods sells their roasted turkey breast at their deli department for $12.99 per pound at the time of this writing in Chicago area… while the raw turkey breast costs a fraction of that! 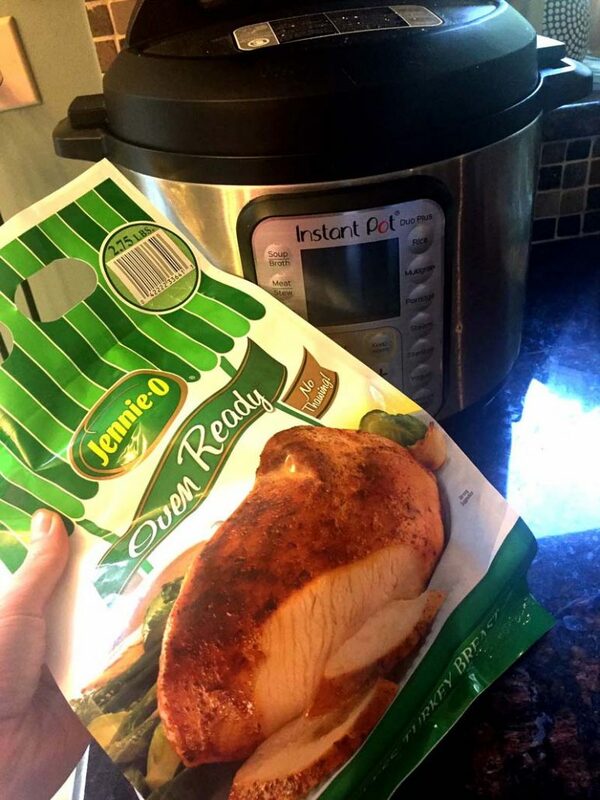 Best of all, it takes less time to cook this turkey breast in the Instant Pot then it would take to make a grocery run! 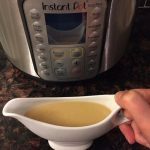 Instant Pot Gravy – don’t throw out the turkey drippings in your Instant Pot that you have after making this turkey breast. Use them to make homemade gravy! Instant Pot gravy is super easy to make and tastes amazing! Instant Pot Mashed Potatoes – truly life-changing recipe, you don’t even need to drain the potatoes! Once you try making mashed potatoes in the Instant Pot, you’ll never make them any other way! Instant Pot Baked Sweet Potatoes – so tender and delicious, Instant Pot makes perfect baked sweet potatoes! You can take this recipe a step further and make Instant Pot mashed sweet potatoes or Instant Pot roasted sweet potatoes – so yummy! Instant Pot Rotisserie Chicken – cook the whole chicken in your Instant Pot to make homemade Rotisserie chicken! It’s so tender, it just melts in your mouth! You can even make it with frozen chicken! Instant Pot Pumpkin Soup – this homemade pumpkin soup is so creamy and delicious! What a perfect way to celebrate the Fall season! Instant Pot Cornbread – yes, you can make cornbread in your Instant Pot! Just mix the ingredients in a bowl, put inside the Instant Pot and it will bake into a perfect fluffy cornbread! You just gotta see it to believe it! Can’t get enough of my Instant Pot recipes? Browse my entire Instant Pot recipe box! 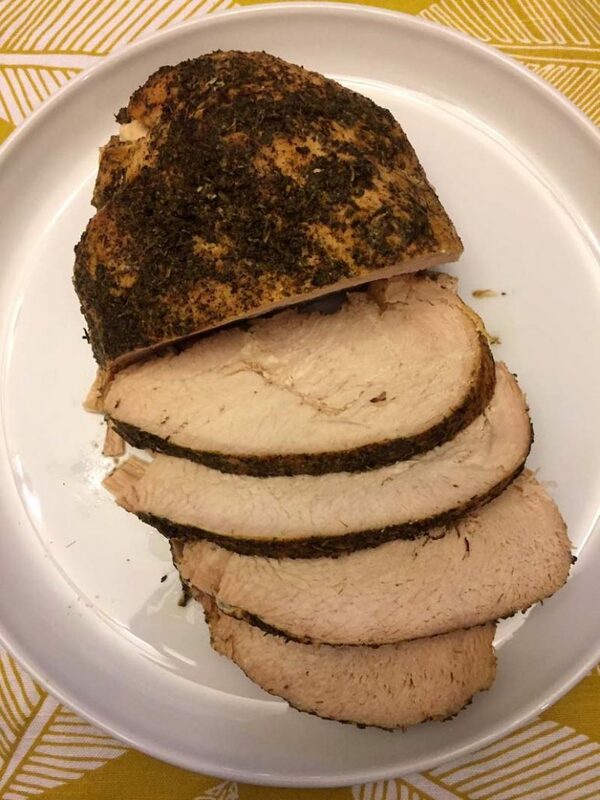 This Instant Pot turkey breast is so moist and juicy! So much quicker and easier than roasting turkey breast in the oven, and better tasting too! Works with fresh or frozen turkey breast! If the turkey breast is labeled as "brined" or "oven-ready", omit the salt. Rub the turkey breast with butter all over (if using). In a cup, mix salt (if using), black pepper, garlic powder, onion powder and Italian seasoning. Rub the spice mix all over the turkey breast. Pour water in the Instant Pot, insert the trivet (the metal rack that came with the Instant Pot) and put turkey breast on a trivet. Close the Instant Pot lid and turn the valve to a Sealing position. Press the "Pressure Cook" or "Manual" button and set the time for 25 minutes on High pressure for fresh turkey breast (or 60 minutes on High pressure for frozen turkey breast). When it's done cooking, let the pressure release naturally for 10 minutes (NR), then quick release (QR) the remaining steam. What would you recommend for the cook time if I doubled up the 2.75 thawed breast in my insta pot? I did just one for Christmas and it took the 20 mins with the quick release pressure. The temp was 165. Since I have the larger insta pot I thought I would double it up this week for another family Christmas. Other blogs I’ve read suggest 6 mins per pound but I fear if I follow that I’m going to have some undercooked turkey. Any recommendations? Have you attempted to double up on these 2.75lbs Jennie-o turkeys? I haven’t attempted to do 2 turkey breasts at once. If one was ready in 20 mins, for 2 at a time I would try 35 mins with QR, take the temp and if not cooked, put it back for another 10 mins.